When designing a complete bathroom renovation it’s important to choose the correct materials for your floor and walls – Here are a few things to consider before you buy. Tiles are by far the most practical solution, as they are easy to clean and can withstand the damp steam filled environment a bathroom can produce. With many different sizes and styles now available there is something to suit all needs from working within a tight budget, to achieving ultimate 5-star hotel luxury. For that classic spa look, working with natural materials such as stone or slate is highly recommended. Tiling the walls and floor with the same design will offer a more streamlined look. 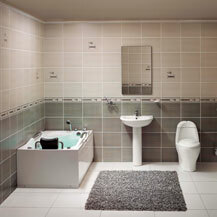 If spacing is limited and your bathroom is compact, it is better to choose the largest tile you can afford. A larger designed tile will visibly stretch the space, making the room appear larger and less cluttered. For maximum glamour, try to utilise highly reflective mosaic tiles along with ultra-chic metallics. As you can imagine luxury like this does not come cheap, so if you can’t do all the walls in your bathroom consider using them on a feature wall or in an alcove to add extra glitz. 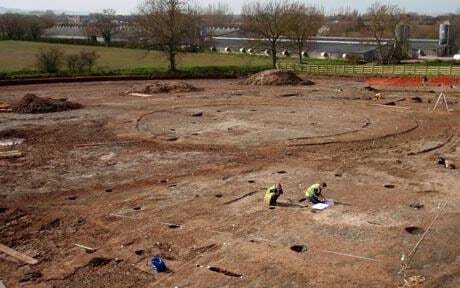 A newly discovered roundhouse and sauna has been discovered on a Cumbria Farm in Somerset England: March 2009. The roundhouse measured 56 feet (17) in diameter, which was one of the largest roundhouses to be unearthed in Britain, and is estimated to be an impressive 3,000 years old. Archaeologists uncovering the site found a large mound of burned stones, which suggests a sauna may have once stood there. A wide range of Roman artefacts were also found including shears, brooches, three Iron Age spearheads, loom weights, vast amounts of pottery and two skeletons.